Why do the English collect conkers? Why did my eldest son collect 4, yes 4, kilos of them this week, leaping about under the trees in delight at every treasure found? In October, our parks are overrun by a scrabbling of children (and parents) under the trees, And for why? 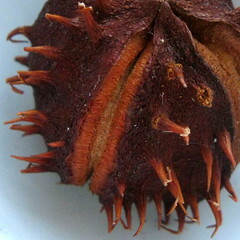 To collect the smooth brown wonders of the horse chestnut tree - conkers. The tourists here in Bath look on, perplexed. The Brit is usually so quiet, sedate and unexcitable. They must wonder "They must eat them, surely? Sell them for vast sums? Use them to make beer? Fuel their fires with them?" Oh no. We drill holes in them, our chidren hang them on a piece of string and do battle with them . Bashing and smashing all comers until they own the last vistorious "Champion Conker" . Now you know , so don't say we don't have a frivolous, competitive side. Why isn't "Conkers" in the London Olympics? I've got a handful myself. I've put them in the corners of my craft room to ward off spiders! ~I love conkers, I have them as door knobs, yes really, well hanging from a cord, to pull and open a door, I've made rings out of them too. but don't store them in a wooden bowl/box, somehow they end up cracking the wood, I've learnt this the hard way. Wow, does that take me back! We did the same thing here in Toronto. Hey, I've got an idea! Canada's hosting the 2010 winter Olympics. Shall I see what I can do? Fantastic! Doorknobs, spider spooks and winter elite conker sports! lol, they must be magic. If I could make beer out of them I would.